Juicy poached hake, combined with sweet green peas and an aromatic salsa verde, is a classic Spanish dish that is light, simple and delicious! With its showstopper clams and gorgeous green flecks of parsley, it’s fancy enough for a dinner party, but quick enough for a midweek supper. During Lent (Cuaresma), many Spanish people traditionally give up meat, as it is seen as a luxury. Spanish Lenten dishes make fish the star of the show, especially cod (bacalao) and hake (merluza). So why not celebrate Lent the Spanish way with hake with salsa verde and clams?! Dice the onions finely, mince the garlic and place them with the olive oil in a large deep saucepan on a low heat. Cook for a few minutes until the onion and garlic are golden brown. Add the flour and mix well. Cook for a further minute. Add the wine and stock to the saucepan and mix well. Turn the heat up to medium and cook for a few minutes. Meanwhile, finely cut the parsley and add to the sauce, along with salt to taste. When the sauce is simmering and has thickened slightly, add the hake to the saucepan. Lay each fillet apart and spoon sauce over the top. Cover the saucepan and cook for five minutes. Add the peas and clams and incorporate to the sauce, but don’t mix too vigorously or the fish will start to flake apart. Cook for four minutes until the clams have opened. Remove any clams that have not opened. 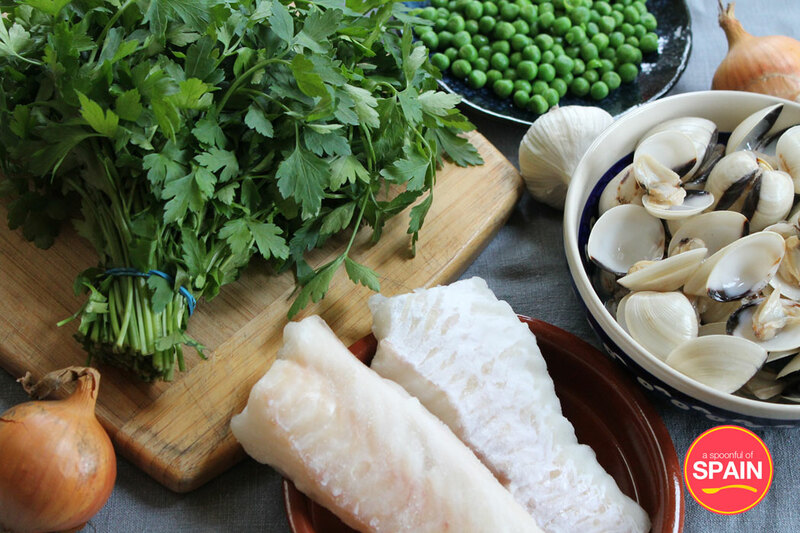 Serve the fillets of hake with a generous portion of clams, peas and sauce on top! Add some boiled new potatoes and green vegetables for a show-stopping meal!